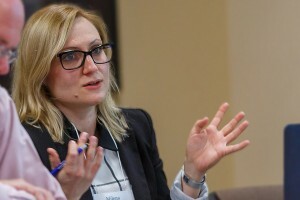 In her contribution to the second international Human Dignity and Human Development Conference hosted by the University of Notre Dame’s Kellogg Institute for International Studies, IZA Research Asssociate Milena Nikolova related human dignity to subjective well-being measures in the context of development. “From subjective well-being research, we learn how to operationalize normative concepts like dignity, develop relevant measures, and use the information to better understand human experience,” she said. At the conference, development practitioners and scholars examined the implications of human dignity for development theory and practice, considering whether human dignity can serve as a common connector among predominant development frameworks, including the capability, well-being, and happiness approaches. “Approaching human development from the perspective of human dignity serves as a locus across differences that might otherwise be intractable in the global environment,” said Kellogg Institute Director and legal scholar Paolo Carozza, who leads the initiative. Photo: courtesy of the Kellogg Institute for International Studies.